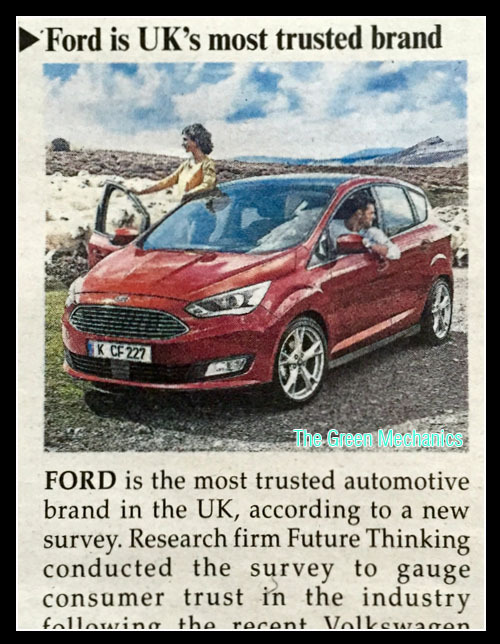 According to The Malaysian Reserve, almost one-third of respondents surveyed in the UK put their trust in one of United States' household brand - Ford. Not too long ago my wife and I went looking for a sedan and considered Toyota, Honda, Nissan and Ford in our shopping list. At that point in time Toyota and Honda seemed pretty comfortable with their commanding share of the international brand market in Malaysia, that they choosed to continue milking Malaysians of their hard earned money by offering bare-to-the-bone cars. While Korean cars were already offering push-start button, reverse camera, navigational display, etc, as standard goodies, the T and H were adamant that consumers don't need all these 'nonsense'. They eventually offered similar accessories, but still it took them a year or so to respond. Next best thing then was Ford. Models within reach - Focus and Fiesta - were both better equipped and we nearly bought one if not for the lack of choices and the lingering issues of after-sale service and spare parts availability. Local brand carrier for Ford may have done some improvement now but you can still hear people talking about such issues. Hard to get replacement parts. On the one hand, this could be pure rumour mongering by rival brands, but on other the other hand, the brand carrier may have actually made amend. [Personally, I don't like to hear Sales Advisor of one brand badmouthing another, no matter how reputable a brand he represents. He maybe telling the facts, but I'd take his 'advice' with a pinch of salt]. Today if you take to the road and observe what cars are driven around you, you'd mostly see locally produced cars, followed by Toyota, Honda, Nissan, Mitsubishi, with some European and American cars in the mix. Chevrolet have been making quite an appearance of late, so, Ford with its long existence here should take note. In Sabah, Ford Ranger, Fiesta and Focus are quite a familiar look, not to mention the relatively new crossovers such as Kuga and EcoSport. In Malaysia, Sime Darby Motors represent BMW, MINI, Hyundai, Ford, Jaguar, Land Rover, to name a few. With so many brands under its belt, there are chances that some would get 'left behind'. Sime Darby had better be up to the expectations if they want consumers to put trust in this brand. A Contractor friend of mine recently bought a Ford Ranger as his workhorse and when asked why he changed from Toyota to Ford, he simply said he wanted to 'try out the American brand and figure out how reliable the truck is'. Hmm, perhaps a thumb up here for Ford, although it still has a long way to go in terms of matching Toyota's market share. No doubt, Ford is a reputable automobile brand that can be trusted. It is all down to the brand carrier (Sime Darby) to play its part convincing the Malaysian consumers.